Bears Cornerback, Charles Tillman, teams up with the Heckler Store to raise money for the Charles Tillman Cornerstone Foundation. The store created a variety of men’s and women’s shirts, youth shirts, and even onesies supporting Charles Tillman and his foundation. 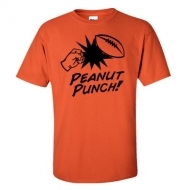 The shirts include graphics such as the “Peanut Punch” and “Most Valuable Peanut”, all printed in a variety of the Bears’ team colors. The Heckler Store will donate $5 of every shirt sold to the Cornerstone Foundation. The goal of this partnership is to raise $10,000 for the foundation which is 2,000 shirts. 900+ shirts have already been sold meaning there has already been $4,500 raised! All donations received by the Cornerstone Foundation will provide 150 children with a Christmas gift as part of the foundation’s program, Holiday Celebration. To purchase your t-shirt today, please visit the Heckler Store at www.thehecklerstore.com.